Tetra Pak provides environmental support for the proper disposal of packaging waste generated in customers’ and retailers’ operations. If you have questions, please submit them via email to falecom.meioambiente@tetrapak.com . Tetra Pak is Forest Stewardship Council® (FSC®) Chain of Custody (CoC) certified. This means consumers can trace the wood fibres at every step through the supply chain, providing assurance that any products bearing the FSC logo support forest management that adopts environmentally appropriate, socially beneficial and economically viable management practices. Currently, up to 82% of the raw materials in Tetra Pak® cartons are derived from renewable sources. Both the caps and the plastic that composes the protective layers are derived from sugarcane. 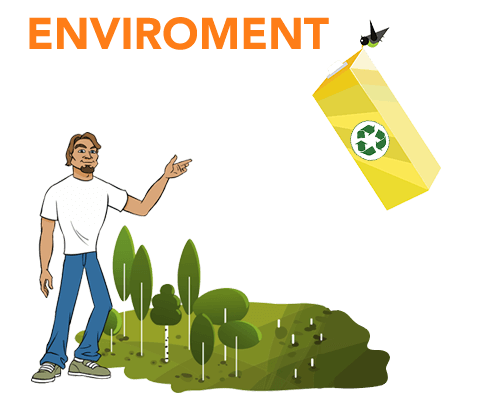 Tetra Pak® packages are 100% recyclable. The Recycling Path site shows the nearest places where consumers can properly dispose of long-life packages and other recyclable materials for selective collection. In which area of the supply chain do you operate? Which industry area do you operate in? Which carrier area do you operate in? Which distribution center area do you operate in? Which point of sale area do you operate in? Copyright © 2017 Tetra Pak®. All Rights Reserved.